The Jordanaires had sung “Peace In The Valley” on the show that afternoon. When the show was over, a young man, blond, courteous with plenty of combed-back hair came backstage to meet them. He was Elvis Presley. The practically unheard of singer was just launching his career as an entertainer. After some small talk and polite exchanges, Elvis said, “If I ever get a recording contract with a major company, I want you guys to back me up.” The Jordanaires’ first tenor, Gordon Stoker, remembers wishing Elvis well, “But we never expected to hear from him again,” he said The Jordanaires are credited with using the “numbers system” before anyone else. Neal Matthews developed it in 1955 for speed in their background work, and, at present, it is used worldwide in the music field. Raymond Clinton Walker, Jr. was born March 16, 1934, the second of 5 children, to RC Walker Sr. and wife, Elizabeth, in Centreville, Mississippi. Ray’s parents were living in Wilkinson, Mississippi, but the nearest hospital was in Centreville. Ray’s parents had completed schooling at David Lipscomb College in Nashville, Tennessee, and moved to Wilkinson, where he became minister of the Church of Christ and a teacher in the public school in nearby. HISTORY TELLS US THAT ELVIS LOVED YOUR STYLE DID HE INSIST ON ANY SPECIAL ARRANGEMENTS? We all worked together. If he had something in mind, it was good and he knew just where to put it. he usually left it up to us. WHAT WERE RECORDING SESSIONS LIKE WITH ELVIS? The sessions were pressure-less. Elvis had the best insight and outlook of anyone we have ever worked with. He got along well with everyone on the sessions. Even if one might have been a little troublesome. We all had a good time in a creative atmosphere. DID YOU EVER APPEAR IN ANY ELVIS MOVIE AND WHAT WAS THAT LIKE? 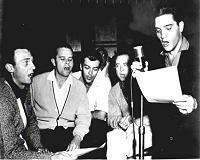 The Jordanaires appeared in “Loving You”, “King Creole” and “G.I. Blues”. It was always, hurry up and then wait on the set. We stayed five weeks on some and went back to correct something on one occasion. It took seventeen days to do the scene on the train in G.I. Blues’; not, working straight through, but with additions and changes and re-writes, it took that long. Very enjoyable, even without the digital we have today. In G.I. Blues, a team filmed all the scenery in Germany and built a square club car on the set, shook it from the back with a long pole and put the scenery in the windows with a rear projector. We never even saw Germany. WAS ELVIS GENEROUS AND DID YOU EVER RECEIVE ANY SPECIAL GIFTS SAY FOR CHRISTMAS OR BIRTHDAYS? Elvis is generous to a fault. Cash he can’t keep; can’t stand to see someone need or really want something without trying to get it for him. We always got good Christmas gifts, usually in the form of a bonus. I think he would have been shocked by what BMG Music is doing today. RECENTLY THERE HAS BEEN AT LOT OF TALK ABOUT ROYALTIES DUE TO THE JORDANAIRES IS THIS THE FAULT OR EPE INC OR BMG MUSIC? We do not get royalties from the recordings, unless the products are used in media other than for which they were recorded. When in commercials or movies, we get paid from the producers and the company using them. The thing we are checking on, now, is the extra tracks from the sessions which are being released and the use in videos. Each track, even if it is the same song, is supposed to stand on it’s own, and a session fee is supposed to be paid for each and every variation of a song, just as though it were another song, entirely. If used in video, we are supposed to be paid for that medium. WHERE WERE YOU THE DAY ELVIS DIED AND DID YOU ATTEND THE FUNERAL? I was driving to Green Hills where I lived. I, also, had an office in the commercial district, in the south of Nashville. I was coming from Madison in north Nashville. It was raining so hard that I could not see the end of the hood of my car. In the middle of I-240 around the east side of town and heard the DJ announce, “It is official! Elvis Presley is dead at the age of 42.” I remember saying, out loud: “Surely the Colonel wouldn’t do something like this for publicity? It must t be a joke?” I’ve never been comfortable with the circumstances surrounding all that. I was traveling at the time of the funeral and did not get to go. The other Jordanaires had work scheduled, which could not be cancelled. We hated not to be there and sent condolences, made a contribution to one of his favorite charities, and spent a special arrangement of flowers.